Pinterest is all the rage. Media outlets everywhere are abuzz with commentary on the service, and marketers are rapidly trying to bootstrap themselves on using it as a traffic generator. In the meanwhile, users continue to flock to it, adding reams of new content daily. I wrote about the basics of Pinterst in my February column, “Let’s Look at Pinterest.” Now let’s examine some of the current news about the platform. … [A] four week moving average of Pinterest’s unique users showed that growth slowed from an 85% rate between mid-January and mid-February, to an 18% rate between mid February and mid-March. Based on the latest data Comscore projects that Pinterest will grow its total unique users in March to just over 20 million, just a roughly 12 percent month-over month increase, after posting a 50 percent increase in February. Keep in mind that 12% is still double-digit growth. That is still more than respectable. I will be interested in seeing if their numbers plateau around 20 million — the way Twitter’s did. Masters of engaging their supporters through online platforms, Obama for America has started managing an account for President Obama on Pinterest. One thing that seems very familiar from the last campaign cycle is that it is the staff, not Obama himself (except occasionally) that runs the account and produces its content. Also much like during the last election cycle, it’s growing fast. The Obama profile has already surpassed 1,500 followers and 40 pins in less than a month of being online, while only posting content for a week of that time. The President’s first pins ranged from pets to political buttons. Some of the Pinterest boards created on Obama’s account include Pet Lovers for Obama, Obama-inspired recipes, The First Family, ObamArt and Faces of Changed. This is the part that makes me nervous. A person behind DDK Portraits, who is evidently a lawyer, made a post about her findings when researching the terms of service, and they are not heartening. If someone decides to sue you and Pinterest over your use of their images, you’ll be responsible for footing the bill for both your own attorney and the one for Pinterest. That’s a lot of court fees. If you’re found guilty of copyright violation, you’re responsible for paying damages assessed against you and all damages assessed against Pinterest. 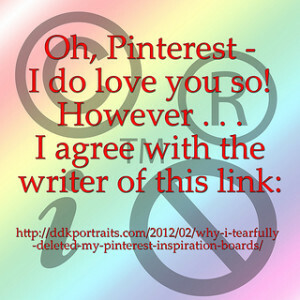 Pinterest reserves the right to prosecute you for violations. It’s a great strategic move on their part, contractually obligating you to bear the risk while not exposing themselves at all. Just think back about some of the file-sharing lawsuits you’ve seen in the news over the years. If a 12-year-old girl can be sued for hundreds of thousands of dollars in damages over a few songs, what might a future defendant face over a few images in a similar suit? What if that defendant was you? Legislation has no prayer of catching up to the speed of online innovation. While we have the legal frameworks like the Digital Millennium Copyright Act in place, the pace of technological advancement creates new and unpredictable situations almost daily. I’m not the only one who sees parallels to the discussions when Napster was king of the hill. Many recent articles on the subject are making that association. Image by PixByDee, used under its Creative Commons license.